The NEW INTELLIBOOST RG1000 SAFETY PLUS (with Air Compressor) Lithium Emergency Jump Starter and Portable Power Supply from RUGGED GEEK features class-leading construction with a unique design perfected in North America for the ultimate in safety and convenience. Compact yet powerful, the INTELLIBOOST RG1000 SAFETY PLUS (with Air Compressor) gives you the ability to safely jumpstart your car, truck, van, motorcycle, boat, SUV, ATV or UTV while the dual INTELLI-USB charging ports, dedicated laptop charging port and included adapters allow you to charge your portable devices including smart phones, tablets, laptops, portable GPS, Android or iOS devices, making the INTELLIBOOST RG1000 SAFETY PLUS (with Air Compressor) an invaluable tool for your on-the-go lifestyle. 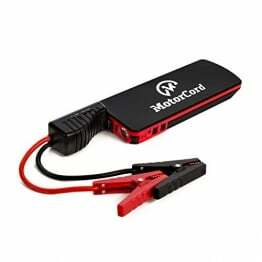 In addition, the INTELLIBOOST RG1000 SAFETY PLUS (with Air Compressor) includes a built-in multi-mode LED flashlight to help you find your way after dark and also operates as an emergency beacon, while our exclusive INTELLIBOOST spark-proof jumper cables make it impossible to short circuit in the event that the jumper cables are attached incorrectly. • Max 1000 Amp starting current: Enough to boost most gas powered vehicles up to 7.0L gas and diesel engines up to 3.5L. • 39Wh 60c Class A Lithium Battery: This allows for the high boosting levels but also ensures it will charge your USB devices. • Comes with the 150 PSI Air Compressor, a Soft-shell, zippered EVA case for protection, a 12V car charger, a UL Listed wall charger, 3-IN-1 USB Charging Cable with new USB-C, Lightning and Micro USB, laptop adapter cable and 9 of the most common laptop tips and of course, the safety of our INTELLIBOOST Cables. • 12 Month Hassle-Free Limited Warranty. If you have any issues, just contact us and we will take care of it. We want you as a repeat customer and will do what we need to do to keep you happy.